There are many different types of palms. These all ask their own specific care depending on their original habitat. A little bit of studying might be a good way to get good results. First, look at the palm’s needs. Can you meet these? A good example is the Cocos nucifera. This species is often found for just a couple of Pennies, even in malls! However, this tropical palm requires a very high temperature and humidity. Something that only can be found in an conservatory or bathroom. In many households, therefore, they only have a few months to live and then die of slowly. But keeping palms in our climate is definitely possible. This article deals with the basic aspects that will make the culture of most palms successful! Most palm trees grow naturally in a tropical climate. So beside from some exceptions, such as Trachycarpus, it is obvious that palms prefer a warm environment. In the warmer months of the year, palms can be held outside on the terrace. However, before the first frost kicks in, they must be placed inside again. Also note that the temperature is affected by several factors. For example, a place in the full wind will soon be a few degrees cooler while the temperatures can rise easily on a sheltered spot against a south wall. On the plantlabel or plant description you should find a minimum temperature given to that species. Keep in mind that this is just an indication and usually applies to adult subjects. Younger palms are much less resistant to cold and should therefore be protected earlier and better. Especially the growth point is sensitive to frost. For protection, it must therefore be well protected from moist. Like any plant, palms also need light. Even extra I might say because the light intensity in their natural habitat is also often high. Palms kept too dark make longer, finer leaves on long, thin petioles. Literally searching for light. But there are also species that are more suitable for darker places. The Kentia palm (Howea) is the best known example. For a good result, it is therefore important to adjust the its place to the natural needs of the palm. Pay attention to direct sunlight! Certainly young palms that have always been kept inside should not be put in full sun directly or the leaves would burn. To avoid this, you need to get used to leaves to the sunshine just like our skin. First, you give a place in full shade en then gradually increase the amount of sunshine hours during a week of 2-3. Leaves that were formed in full sun will resist right away to the sun. One of the hardest things in plant care is the water supply. You should certainly must not over water but you don’t want to give too little as well. But, you can easily check whether watering is needed or not just by feeling with a finger a few centimeters deep in the potting soil. If the soil feels dry there, watering is desirable. Just looking at the soil does not give a good impression as the top dries out much faster in contact with the air. In addition, you must also take into account the location. In the full sun on a hot summers day, a palm evaporates many liters of water. Watering more often is then definitely recommended. A windy place will also increase the evaporation. During the winter months, growth is almost absent and water needs are therefore more limited. In the saucer, there must be no water left to avoid root rot. But also the pot in which the palm is cultivated is important. A stone pot absorbs and evaporates the water much faster, which also causes the soil to be drier. A plastic pot however keeps the moisture. 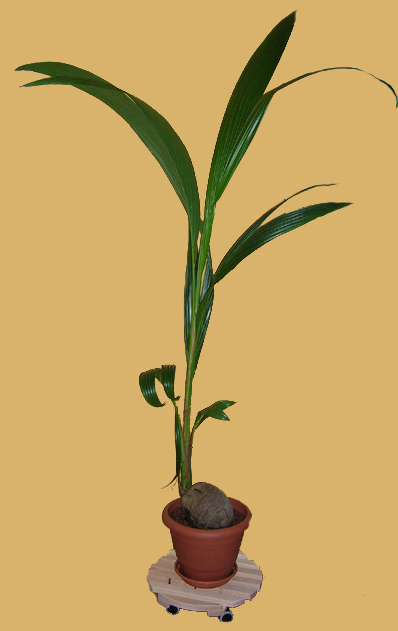 Therefore, it is best to make a conscious choice for the type of pot when transplanting the palm. also see: How much water does my palm tree or banana plant need? Of course, it can rain quite a bit in our climate. In principle, this does not pose a problem for your palm as long as the excess of water can flow away sufficiently from the bottom of the pot. For longer rain periods, it may be advisable to temporarily remove the saucer. There is no need for extra care when speaking about palms planted in the garden. The rain should be absorbed in and flow away easily in the soil. In their natural tropical environment, palms mostly have a high air humidity. When the palm is kept outside during the summer months, this aspect will not be a problem. It rains sufficiently in our climate so the humidity is high enough for the palm. But when it comes to the winter months when the palm is kept inside it becomes a bit more difficult. In most of our homes, the central heating system makes the air very dry. The leaves will dry out and, moreover, the palm becomes more sensitive to pests like spinning mites! You can counteract this by regularly spraying the foliage (not the stem!) with water. also see: Air humidity too low? This is how you solve it! For good results, use a good potting soil as well. 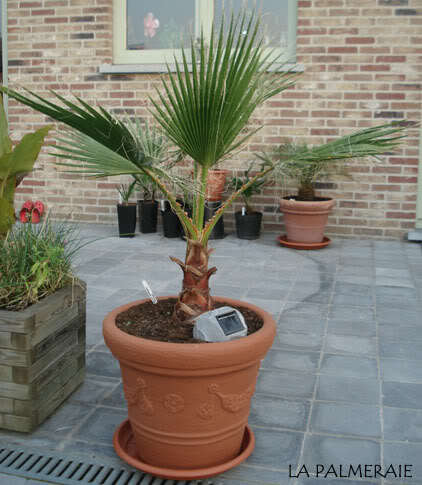 DCM® by exemple, has special potting soil for palm trees. In addition, it is important to provide adequate drainage. The pot must therefore be provided with drainage holes. Also, lava rock or grid can be mixed with the potting soil for good water drainage. Provide enough fertilizer during spring and summer which is the growing season. In winter this makes little sense. Dry organic fertilizers can be handy for long term fertilizing but the may have to much of an odeur for in house use. Liquid fertilizers for palms or green houseplants will also do. The growth will be faster and your plant will be healthier. But don’t over do with fertilizer! In any case, respect the prescribed dosages!